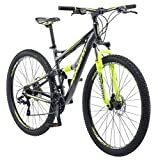 The range of full suspension mountain bikes on the market in 2019 is enormous, with models ranging from simple and affordable mountain bikes to much higher end mountain bikes loaded with extra luxury features for your comfort. Choosing the right one for your personal needs can be intimidating, as the range available is so wide and the technical jargon involved can be confusing. We’ve narrowed this down for you a bit, hunting through the best brand sites, in order to help you decide, and your choice between the bikes below can be down to personal requirements rather than objective quality levels. Below, we’re going to break down the major features of some of the best trail bikes on the market in 2019 to help you confidently make a decision. The list below has been designed to help you to find the ideal full suspension mountain bike for your personal preferences, giving you full comfort and satisfaction in the confidence of knowing that you’ve made a solid decision. All of the bikes below are among the best on the market of 2019. 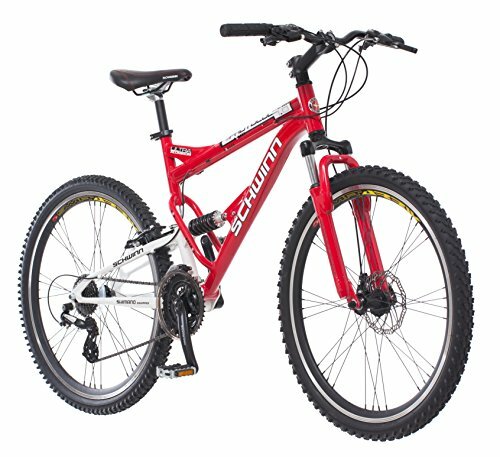 The Schwinn Protocol 1.0 Men’s Dual-Suspension Mountain Bike is fully equipped with suspension. The fork of the bike is packed with shock-absorbing suspension, protecting your arms and shoulders from the strain and ensuring that the bike absorbs the impact of rough terrain, all while still allowing you to feel the surface beneath your wheels and maintain a high level of control. The gear system comes with 24-speed EZ-Fire Shimano trigger shifters and a matching derailleur. This high-end gear technology ensures an easy gear shifting experience with minimal disruption to your cycling experience, keeping your ride smooth even on more complex trails. In addition to this, the lightweight aluminum frame balances out the added weight of the suspension features and higher-end additional components such as the gear system. 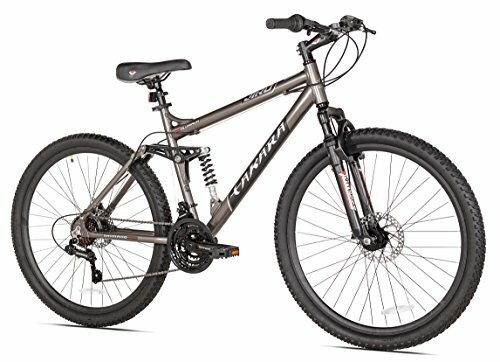 Why We Liked It – The light weight of the Schwinn Protocol 1.0 Men’s Dual-Suspension Mountain Bike’s aluminum frame keeps it easy to transport, while the front-loaded suspension keeps the strain off your arms and shoulders for added comfort. 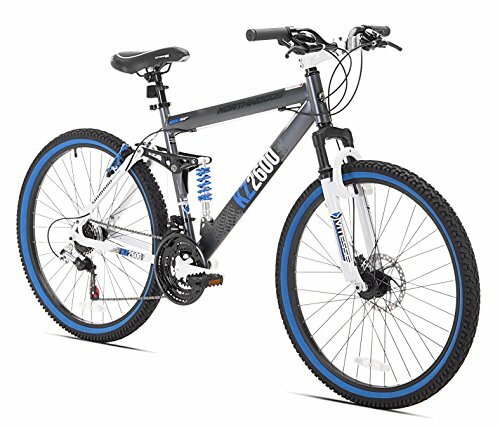 The Kent KZ2600 Dual-Suspension Mountain Bike is equipped with 21 speed Shimano gear shifters and a rear Tourney derailleur, giving a higher level of precise control over gear shifting, and the front wheel features a disc brake to give a more refined level of control over your stopping distance. Its small 26-inch aluminum frame is compact and lightweight but comes with both a rear floating beam suspension mechanism and front fork suspension to absorb shock and prevent it from impacting on your arms and shoulders. This advanced dual suspension design absorbs the maximum amount of shock possible, ensuring a comfortable ride over even the roughest of terrain at high speeds. Overall, the Kent KZ2600 is a compact trail bike packed with premium comfort features. Why We Liked It – The Kent KZ2600 Dual-Suspension Mountain Bike offers a more complex suspension mechanism than many others. Its rear-mounted floating beam system adds an extra level of comfort and smoothness on top of the more common front fork suspension system. The Takara Jiro Dual-Suspension Mountain Bike’s lightweight aluminum frame is equipped with a gear system made up of Shimano Tourney derailleurs and intuitive handlebar shifters, giving a natural and fluid sense of control to gear shifting with minimal interruption even at high speeds. It also features disc brakes on both front and rear wheels, giving the maximum level of precision control when stopping. This all combines to give a strong sense of control when riding, supported by the combination of front and rear suspension systems for added comfort and the extra large tires to smooth out bumps in the road and reduce impacts, putting less strain on your arms and shoulders. Why We Liked It – The Takara Jiro Dual-Suspension Mountain Bike is a bike for those who want a smooth, comfortable cycling experience, with an advanced and intuitive gear system and extra large tires to give the smoothest ride possible even on rough ground. 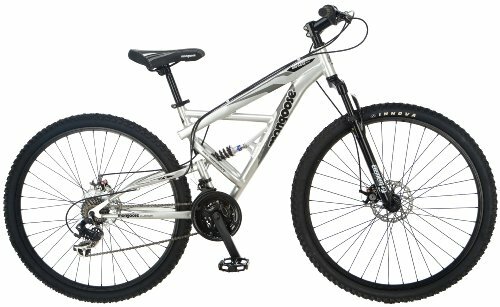 The Mongoose R2780 Impasse Dual Full Suspension Bicycle has a light enough frame to keep the whole package relatively light without compromising on features by compensating for the added weight of its extras. The bike features quick release wheels, allowing for easier maintenance. Equipped with an Element Suspension fork for additional shock absorbency and precise control, the Mongoose R2780 also comes with twist gear shifters and a 21 speed Shimano rear derailleur, giving an exceptional level of control and flexibility on rough, difficult terrain and trails. 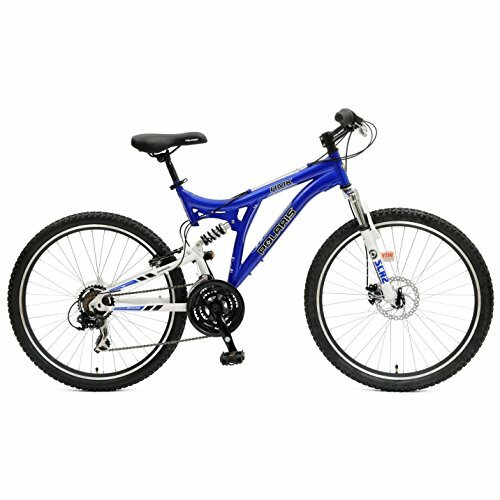 This is a comfortable trail bike requiring minimal effort to maintain in high condition, ideal for heavy use. Why We Liked It – The Mongoose R2780 Impasse Dual Full Suspension Bicycle combines fork suspension technology with the premium Shimano gear mechanism, offering excellent, precise control in motion. The Polaris RMK Full Suspension Bicycle offers the full range of high-end Shimano gear change features, with derailleurs at both the back and the front, as well as twist shift handlebars for added ease of changing. No matter what surface you’re riding on or what speed you’re traveling at, the Polaris RMK should be able to change gear smoothly with minimal interruption to your journey. This is a bike designed for easy customization, with quick-release wheels (also allowing for easy tire maintenance) and an adjustable seat pole allowing for some of the lower quality elements to be easily replaced if desired. Why We Liked It – The Polaris RMK Full Suspension Bicycle is a sturdy piece of equipment, with a steel frame rather than the lightweight aluminum construction offered by many other models. This is balanced out with lightweight aluminum wheels, but these can be easily replaced with alloy if you’re looking for something with more precision. Gears are exceptionally important in mountain biking, as changing terrain and slopes requires different gear settings. The added control of a wide range of gears can prove important on rough, difficult terrain. Most bikes offer gear levers attached to the handlebars, but some allow you to change gears through twisting the handlebars. The twist gear system is smoother and easier to use at speed, giving a little more control and fluidity to the gear change experience. This slightly more fluid control can improve the cycling experience when traveling faster, making more of a difference for more dedicated cyclists. Disc brakes enable your bike to stop faster, giving more control and a more comfortable braking experience. This is because they offer a larger pad than alternatives, providing a larger contact area against the wheels for faster braking action. In addition to this, disc brakes tend to last a little longer before requiring replacement, reducing the level of maintenance needed to keep your mountain bike in good working order. Different mountain bikes come with varying sizes of wheel, and this can substantially affect the experience of riding the bike. Larger wheels mask the roughness of the terrain, making uncomfortable bumps seem smaller and easier to ride over comfortably and smoothly, while smaller wheels allow you to feel the full range of textures beneath your wheels as you ride. Larger wheels may seem like the obvious choice for comfort, but smaller wheels have their advantages too; that added ability to feel the ground beneath you gives more control, helping you to feel properly in tune with the ground below you and to adjust to fit changing surfaces more rapidly and fluidly. The wheels of your bike take more strain than any other component during a bike ride. This can lead to damage through extensive use, and so sturdier wheels can be a valuable feature in any mountain bike. Damage to your wheels can push them out of shape, reducing control over your movement and potentially causing problems with your ride. Alloy wheels are designed for strength and resilience, reducing the chance of such damage and keeping your bike as easy to control as possible even through heavy use on rough, hard ground. Hardtail bikes offer suspension at the front but not the rear wheel, while full suspension bikes have suspension systems built into both the front fork and the rear wheel mount. This gives greater impact absorbency, reducing the shock of riding over rough terrain. Hardtail bikes can be lighter, as suspension systems add to the weight of any bike, but offer few mechanical advantages. As such, unless the weight of your bike is the primary concern, full suspension options are likely to be the better choice. There are a huge number of full suspension mountain bikes on the market in 2019, as well as a similarly wide range of hardtail bikes, but the 5 listed above are some of the very best. All of these offer powerful suspension and good control while being relatively light and durable. The question of which trail bike is right for you will depend on which features you prioritize for your personal needs; some of these bikes focus on comfort, while others focus on precision control, smooth gear shifts, or fast braking. Your decision should focus on your personal plans for your mountain bike. Consider whether you intend to use it for rougher, more extreme terrain or more casual off-road cycling, as well as your expected speed or intensity of bike rides. All of the bikes above are worth considering, and hopefully, this guide will help you to buy with confidence, knowing that whichever you choose will be a good bike for you.